After 2013 saw three states – Nevada, Delaware and New Jersey – enact laws for regulating an intrastate online gaming platform in some format, it was thought that 2014 might be a bellwether for others to join the party. Just a couple of weeks into the New Year, however, those hopes are being quickly dashed. According to Iowa Gaming Association president Wes Ehrecke, the state of Iowa is unlikely to take a look at any regulating of the online industry for its residents. The issue isn’t whether such legislation is necessary, Ehrecke states, it is that the growing state-by-state models of online gaming haven’t been in existence long enough to draw any conclusions as to their success. Many factors, including the possibility of interstate compacts, have yet to take seed and, as such, the Hawkeye State is proceeding cautiously in enacting any laws. Another issue in Iowa is their legislative session planned for 2014. The state started a 100-day session on Monday and has a full slate of legislation already on the agenda. Proposals to draw business to the state through tax credits, enhancements to their workforce training programs and the state’s budget are all planned to take center stage in the Iowa General Assembly, leaving other proposals such as online gaming sitting on the sidelines until at least 2015. There is similar news in California when it comes to online gaming legislation, but it is more of a politics issue there than one of other priorities. The Golden State, which has been trying to enact some sort of online gaming (probably only poker) legislation for the past four years, continues to be bogged down by the different factions that are involved in the game. The California card rooms, horse racing tracks and the powerful Indian casino industry have yet to come together behind one concrete bill due to their differing priorities. Last week, one of the prominent legal authorities regarding online gaming,Professor I. Nelson Rose of the Whittier Law School, commented on Fox Business about the complexities of the California situation. Rose noted that it would be 2015 “at the earliest” that any legislation would pass in the state, citing that “it’s all politics” when asked what was blocking movement. “The legislature and the governor are trying to bring in online gaming to balance the state budget,” Rose said. “The (tribal casinos) are in favor of online gaming as long as they are the ones to do it,” Rose continued, meaning that card rooms and horse tracks would be shut out of the industry. California gaming totals from 2011 show that over $6.9 billion was brought in through revenues in the card rooms, racetracks and Indian casinos and that the Indian casinos are contributing a sizeable chunk in taxes. The state government in Sacramento received $387 million in such revenues from Indian casinos in 2012, demonstrating the potential market for an online gaming operation in the state. Florida was long thought to be one of the state’s that would jump at online gaming, but the state went the opposite way instead. Last year, the Florida legislature passed laws outlawing “electronic gaming” which forced subscription based outlets such as ClubWPT.com out of the state. Other states, such as Massachusetts, Pennsylvania andIllinois, have considered online gaming legislation but not moved forward with passage, while Mississippi voted down such legislation last year. The slow pace of the state-by-state regulatory process is spearheading a federal drive by the Sheldon Adelson-led coalition to push for a federal ban regarding online gaming before more states get in the game. A proposed bill called the “Internet Gambling Control Act” would strengthen the current Wire Act of 1961 to include online gaming and outlaw the practice. 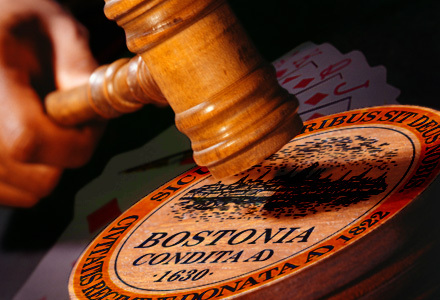 The move comes on the heels of a less-than stellar showing by Adelson’s forces during a hearing in December regarding online poker legislation proposed by Texas Representative Joe Barton. With the major midterm elections on the horizon, it is unlikely that state legislatures are going to take any bold steps regarding the hot button issue of online gaming and poker regulation. Thus, it probably will be 2015 before any other states join the triumvirate of Nevada, Delaware and New Jersey in the U. S. online gaming industry.